Voting For Our Municipal Elections. Elections to various local bodies were held yesterday in many parts of our state. Like I inevitably do, I voted too and here is proof! 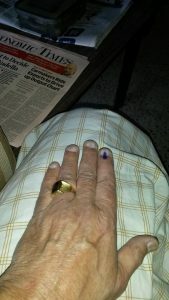 To those who are unfamiliar, in India, people returning to vote more than once can happen and has happened in the past and so, a preventive measure is to apply an indelible ink mark on the left forefinger of the voter just before s/he enters the booth to register the vote. Indians however are famous for their jugaad. A very innovative solution has been found to overcome the problem of the ink mark by this simple device! 12 Responses to Voting For Our Municipal Elections. or should i say amazingly real! That is why that photograph has gone viral here. 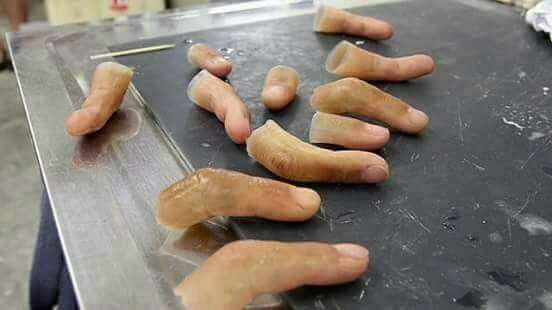 Those fake fingers are really creepy! As you probably know, Northern Ireland voters were once famous for their slogan “Vote early, vote often”. But there are now strict rules that prevent people voting twice, including having to show photo ID. Yes, we too have to carry our Voters Identity Cards with our photographs embedded in them. The fingers photograph is just for fun. It however went viral and I shared it with my readers. The fingers are just a joke Cathy. Each voter has been provided with a photo identity card which has to be produced before the voting process even starts. Well, jugaad is an interesting new word and an interesting work-around for voting. Can hardly wait to see what happens when retina and other such intimate i.d. systems become more prevalent for use in various way with what sort of work-arounds they’ll prompt. joared recently posted..RESIST —– PERSIST ! ! ! The finger jugaad is a joke Joared. We have to produce photo identity cards specifically issued for registered voters at the time of elections. The site is real and the rumour turned out to be just that.